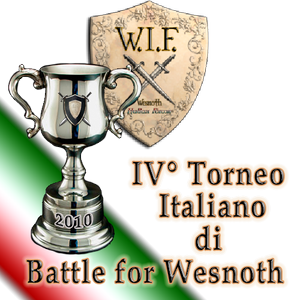 For my research, one of the interesting aspect of this tournament is that it is based on a customised scenario which is developed and maintained by italian members and for the italian tournament, but which is available to anyone through the game "add-ons" interface. Therefore, a local practice directly connects with the growth of BfW, in the broad sense. Of course there are some questions that neet to be investigated further, such as: whether or not this customised scnario is also used by other people; how does the current status of the game design hinder/foster the features of the customised scenario; whether or not these kind of local practices are common across the whole BfW community. Submitted by giacomo on Sun, 11/28/2010 - 11:30. On Wed the 23rd I played the first match of the tournament against my opponent. Arranging the game was a negotioation between the two of us, and happened mainly through the private messagge system of WIF forum. We made the last 'tweaks' before the match in the #WIF irc channel. We also agreed to allow observers during the game. The whole game lasted about 2 hours and it took me in for the entire match. Perhaps it was the fact that 3 or 4 observers were present for the whole match, perhaps the fact that it was an 'official' match for the tournament, whatever reason it was, I really played as concentrated as I never did before in BfW. My opponent was an 'expert' though he didn't play for long at BfW, but his experience came out quite soon. For the whole game he played by attacking, while I was mostly bounded to defend. Beside experience, this was also determined by the tactical advantage that is given to the one who begins the first turn (I was the second in the turn). Here is the replay of the game.